It's every man's dream to break the law and run off on a tough looking chopper. And here is your chance to do so! And not just a simple street ride. No, you will have to escape through the train track. Not the most comfortable ride, but it's fast as hell! Pick one of the cool looking bikes and take your ninja to safety, far away from the chasing cops. The adrenaline can be overwhelming! Great game that will keep you busy for hours to come. Perfect to kill some boring time too. And it's still totally FREE. 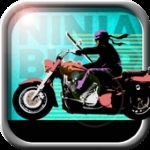 Ninja Bike is totally challenging and keeps you entertained the coming weeks! Download now while it's FREE. Because that can be over anytime soon. JOIN THE NINJA BIKER COMMUNITY TODAY! Never miss this game. Its one racing game you cannot do without!